Still wounded from a recent heartbreak over her boss and lover, Will, Cassie Robichaud throws herself into service with S.E.C.R.E.T., the mysterious organization that changed her forever by bringing her deepest sexual fantasies to life, one step at a time. Now, it’s Cassie’s turn to guide the group’s newest candidate, Dauphine Mason, recruiting men to execute a new set of fantasies. As Cassie worries that the right time will never come for her and Will, she finds inspiration helping Dauphine in S.E.C.R.E.T. Both women navigate the rocky path between their hearts and their passions, hoping to discover what they truly want in life and in love. S.E.C.R.E.T. 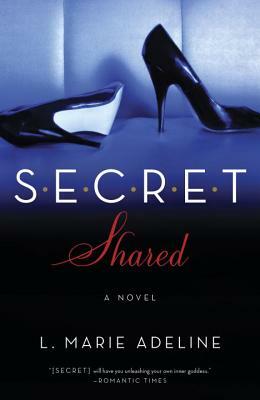 Shared is a romantic, adventurous, and sexually charged sequel to one of the hottest new series in erotica. L. MARIE ADELINE is a pseudonym for the bestselling author Lisa Gabriele. SECRET, her first novel in this series, was an international bestseller. Her final novel in the internationally bestselling SECRET trilogy, SECRET Revealed is out in May 2014. Visit her at www.secretnovels.com.